Webster University Athens' first-ever Webster Works Worldwide project on Oct. 7 brought students, faculty and staff to the soup kitchen of Caritas Hellas Refugee Center, where they helped serve over 200 meals to refugees and their families, mainly from Syria. The students also had the opportunity to hear a lecture about the refugee situation in Greece and the functions of Caritas Hellas by the center’s social worker, Aglaia Konstantakopoulou. In addition to volunteering, a number of items were donated to the center, such as diapers, cans of milk, sanitary items, clothing and shoes. The students worked in the kitchen, in the serving line, at tables and also at the front door greeting refugees. Some of the students heard the story of one refugee and his long journey from Syria through Turkey and eventually to Greece. He showed them a video he took with his phone of the treacherous journey by sea from Turkey to Greece. He noted he hadn’t had a real meal in 30 days. "I was amazed when I heard about the personal experiences of the people we were helping," said Noah Laster, a Film Production major in Webster's School of Communications. "To hear a man try to describe going hungry for weeks completely caught me off guard. We take so much for granted in this world and it is important to step outside yourself and try to consider the lives of others." The students had such moving experiences throughout the day that several asserted they will continue to volunteer throughout the remainder of the semester. Megan Roedner, who is studying Elementary Education in Webster’s School of Education, is one of those students. 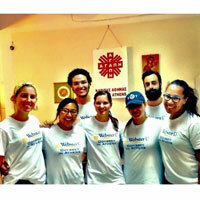 "My first time volunteering at the Caritas Refugee Center was very eye opening," she said. "My time there made me grateful for my study abroad experiences and it also made me want to help more. With that being said, I can’t wait to continue to volunteer at Caritas on a weekly basis for the rest of the semester." In addition to the students’ weekly volunteer work, they decided to host a holiday celebration for the children at Caritas in mid-December. The students will be fundraising and use the donations to purchase toys and useful items for each child. The center will be transformed to a play area with arts and crafts activities, in addition to games and toys to play with. Pizza will also be served to the children and their parents. "To be able to have an impact on the lives of refugees of all ages and the opportunity to exchange personal stories in various languages only makes me want to help out with such great organizations like Caritas more often," Roedner said. ”I'm very excited to have a part in planning the holiday celebration for the children in December. Dina Skias, director of Student Affairs and Odyssey in Athens Study Abroad Program at Webster Athens, was thrilled with the outcome. "This is a wonderful opportunity for our students to get involved," Skias said. "The idea of the party is to give the children a chance to play and interact with each other, something they do not get a chance to do on a daily basis. They usually come to the center with their families only for meals or to receive other services. They have been through so much adversity and hardship at such a young age, if we could give them a chance to be kids and let them laugh and play, even for a day, we will have achieved our goal." The organizing committee for the holiday event consists of Webster study abroad students Dominique Nadeau, Megan Roedner, Victoria Jewell and Anna Gaffney. If you would like to assist in any way, you may contact one of them or Dina Skias, director of Student Affairs and Odyssey in Athens study abroad program, at Webster Athens at skiasd@webster.edu. Pictured above: Megan Roedner, Anna Gaffney, Noah Laster, Victoria Jewell, Nadia Black, Julian DeBarry and Dominique Nadeau.